Here is magic woven into a quilt. Love sewn into every seam, every colour chosen with love and joy in mind. The fabric is all brushed cotton, which reduces choice considerably, so some have rather larger designs than I would ideally have chosen for this pattern. However final choice of fabric, pattern, and layout was out of my hands on this one! It is of course Hunter’s Star – you really do have to hunt for some of the stars! (It also suits a Sagittarian being The Archer, another form of hunter…) I have done my best to emphasize them by quilting around each one, and with a relatively high loft filling this keeps the softness. It also conveniently disguises the overlapping corners, which make more of a bump with brushed cotton than a thinner fabric would. In between the stars, I have sewn butterflies – which are mainly visible from the back. Creatures of beauty and transformation, they bring light to so many situations. They also fit well with the fabrics used, most of which contain flowers or butterflies or both. All were done by making templates from photographs of British native butterflies and chalking around the templates before sewing. 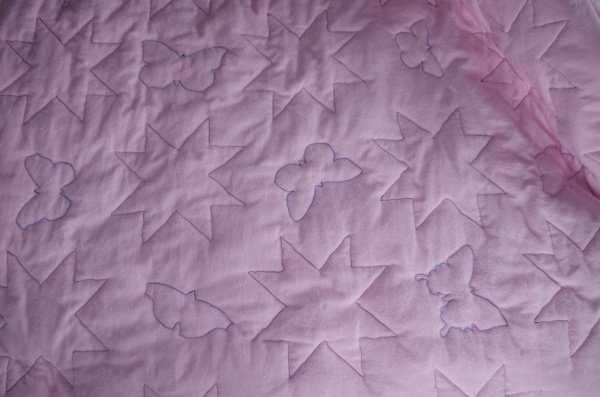 Quilt back with butterflies and stars. Here is a project I had in mind for a few years before actually making. I explored various hare ideas, and then last summer sketched out a plan, yet it still took me until April to actually start making it – and until now to get it hung on the wall. Clearly it has its own perfect timing! There is a lot of symbolism in this quilt; some personal, and some more general. The Three Hares is an ancient symbol seen in China, Ukraine, Iran, France, Germany, and several places in Britain, particularly Devon. They were mostly made from 6th century to 15th century and follow the old Silk Road trading route, although the majority are in Germany and England, particularly Devon. Most appear in Christian churches, often near to a Green Man, but also in synagogues, Buddhist caves, Mosques and on ceramics. Interpretations of the meaning vary widely. I have chosen to make this symbol into a wall-hanging for our home partly because the hare is the only one of my spirit animals that is also loved by the rest of my family, but also because there are three of us in our family, all dependent upon each other. I wanted to celebrate and strengthen that bond. Making the quilt posed a number of challenges, and used some techniques that were new to me. The gold disc (is it the sun or the moon?) was inspired by a Klimt painting using random rectangles of gold patterns, but I didn’t want to create something that was so random it was impossible to cut or to sew. So each quarter has rotational symmetry, and there is a Brigid Cross in the centre. The outside border was going to be more random in terms of widths, but this more equal layout seemed the simplest method for sewing. I still had a problem that the inner disc quadrants came out slightly small, something I possibly should have anticipated, while the outer sections came out wider, requiring some adjustment when joining the quarters. 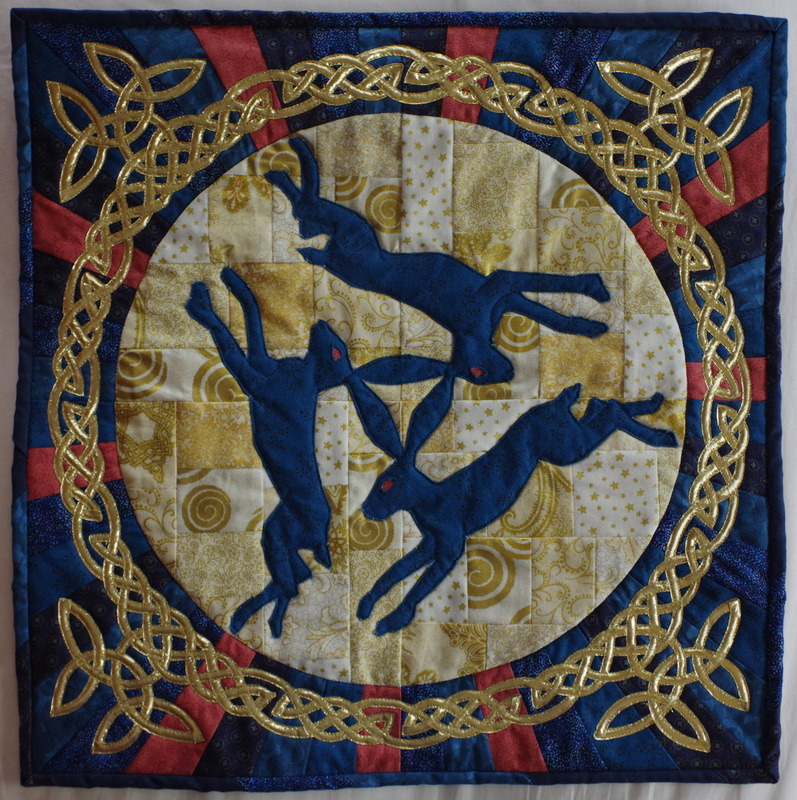 The hares were made using a pattern drawn onto interfacing, cutting it out and ironing it onto the fabric, and then folding the fabric under this, as I did for the Pooh Bear Map quilt a couple of years ago. The eye holes didn’t want to fold under neatly, so I cut them out and then satin stitched the red fabric in place. The rest was stitched in place through all layers of the quilt. Celtic knotwork is not something I have tried before in fabric, although I have drawn many over the past 20 years or so. But when I saw ready-made gold bias tape for sale, I realised that would be an ideal solution for this project. Usually knotwork is designed to fit the space available, rather than having a pre-set line width as I had, so trying to work out how many crossing points to allow made this more challenging for me. Also I needed to include the corners in the design rather than just the border, which is not something I have done before, so I had to do a lot of thinking and exploring to work this problem out. In the final corner design, based on a double triquetra, it proved unexpectedly easier to do in bias tape than to draw. I would ideally have liked a single continuous line through the whole border, but with an even number of crossing points this was not going to happen! Instead it is four interconnected lines, which fits with the symmetry of the rest of the design. Finally, the edging. I repeatedly held different dark blue fabrics along the edge, and some gold or red fabrics, over several days. Nothing looked right. Eventually it came to me that it didn’t want a single colour, it needed several. Given I was rather short on most of the colours anyway, this worked in my favour. However, after all the days I had wasted in not doing the border when my sewing machine was needed for other things, I gave up on calculating what size to make the pieces or how many I needed and just pay attention to any intuitive messages that came. I used every piece I cut in a long strip, and had just over an inch to cut off at the end. I could never have calculated this as accurately. The finished quilt size is just under 18” square. 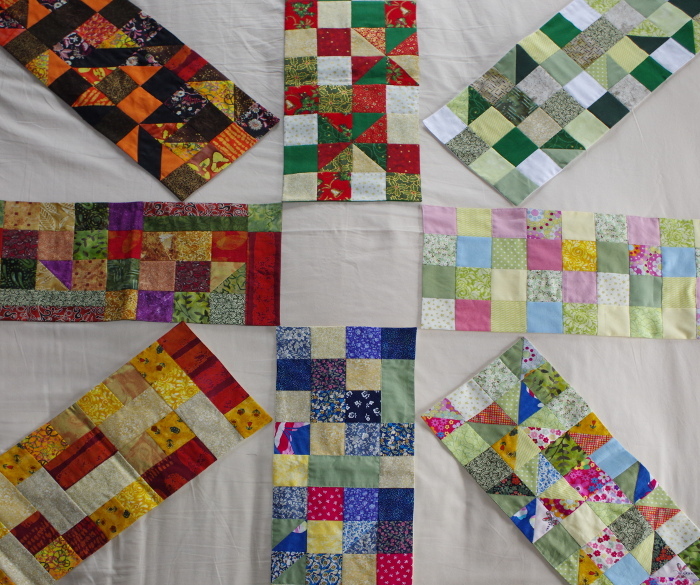 I was able to use several scrap fabrics for the quilt, but around half were purchased new, leaving more for my stash. Such seems to be the cyclical way of my quilting. Here is the last of my Sabbat quilts, made during the last Spring Snowstorm in early April. It has the largest number of fabrics of all the quilts, 24 I think, helped by some of the leftovers from recent dressmaking and bunting projects, as well as the donation of some scraps left over from a quilt my grandmother made me when I was little. So this quilt has real family history in it! The design is inspired by the flowers and colours of May, and by the whirling patterns of Maypole dancing. It started off very regular and formal in its arrangement but I was a row short; it ended up much more freeform in its twirling, swirling around, but I’m quite pleased with the way it has come out. The only thing I might have changed is that on three of the corners a diagonal seam runs into the corner, which was hard to trim or turn properly. This would not have been a problem on a normal quilt with a wadding layer and bound edges, but these are unfilled, just turned like a bag with one colour being chosen in each quilt for outlining to join the two layers. Unlike the other quilts I had no choice of which colour to outline on this one, green being the only plain colour used across the quilt! It has been an interesting project to make all eight – and challenging at times when I was struggling to sew! I deliberately made each one unique, not comparing them as I went, so here is the first time I have put them all together. To me they make an interesting impression of how colours change over the year. I might have exaggerated this more if I had made them all at the same time, and had the fabrics I now have, but that is the beauty of making one at a time. The design changes had a logic, which isn’t so apparent here, but this may be the only time they are all seen together. Samhain, Yule, Imbolc, Spring Equinox, Beltane, Summer Solstice, Lughnasadh, Autumn Equinox. Over the next year I hope to make items to go in the displays, since some sabbats definitely do better than others at the moment! Each sabbat has seen something being made and something stored from previous years, but like our special tree decorations that come out December after December and are passed on through the family, and inspired by the nature displays in the Steiner School we used to visit, I would like to create more ‘special’ things for the rest of the year as well. Here is my quilt for Imbolc, season of Winter thawing to Spring. It is always a special festival to me, celebrating Brigid, the one Goddess I have had a really long term relationship with, and I wanted to reflect the square shape of her cross in the quilt. So this has a more organised colour pattern than the previous seasonal quilts I have made. I’m still managing to use up scraps, although a certain amount of trust is now being called for that I won’t run out before I finish the series. Having enough backing fabric is also starting to get tricky – for this one I used white as without wadding any other colour showed through the white squares on the front, but I had to make it in three pieces. The colours of Imbolc always make me think of snowdrops, which are often associated with Brigid and the festival itself – despite having only been introduced to Britain in the 1500s. It is true that they often flower at the right time of year, although this year one clump of mine were showing white just a day or two after the winter solstice. This quilt has again raised the question of when to create a display for each Sabbat. Mostly I change things a few days or a week before, except the Yule display was started at the beginning of December. However, there seems to be a strong tradition around here of removing all Christmas things on or by the 5th January, which leaves a surprisingly long time for an empty display! So I waited a few days and then put out the new Imbolc quilt, but found I was then ready to clean the house and bring the freshness in! Did Spring arrive early this year? I now understand why Steiner schools sometimes have the addition of ‘Mrs Thaw’ to fill this gap, although she could come any time up until May depending on the weather! This is now the fifth quilt I have made in the series of 8 for each sabbat display, and the first where the colours had a small amount of planning in their arrangement – rather than just the total random, ‘scrappy quilt’ look. I did not have many suitable fabrics for Yule, 3 golds, 3 greens, and 4 reds although one was in very short supply. Had I started with this quilt, I would have probably made it far more definite in its design by using some colours for the stars and different colours for the borders, yet this interests me precisely because it wasn’t done that way. It draws me in more. The stars made me think of spiky holly with its bright berries, as well as poinsettia plants sold everywhere but needing more warmth than our house generally offers on a winter’s night. There is also the coming of the light, directly from the sun as we celebrate its return – and for two months of the year I have an unobstructed view of the sunrise through trees from my bedroom window. Most years (but no longer guaranteed) there is also light reflected by snow, bringing a wonderfully uplifting feel at what is generally a dark time. Making a series of quilts that are supposed to be an exact size has also been a learning experience. My sewing accuracy wasn’t bad before, but sew each 1/4inch seam just 1/2mm out, and over 25 seams you have gained or lost a whole inch, 25mm. That is assuming my cutting was accurate to within the same tolerances! So it took me to quilt 4 to get almost the right finished size, and this one is just slightly long. Given they are all made slightly wide, long looks good. The other good thing I have finally learned is how to work methodically when picking up each pair of pieces to sew, in order to keep them in the same position and rotation. It has taken me a long time to master this basic skill! Normally I change the display about a week before a sabbat, but it felt appropriate to get this out last weekend. Not because lights and decorations are up everywhere else and M enjoys them being up in our house as well, but because winter arrived with the last leaves falling off the trees, two dustings of snow and ice on the pond. Autumn has passed, it is dark outside, and I feel ready to close the curtains and be looking within. Enjoying candlelight, being cosy in the long dark evenings, and preparing for what is to come. In my case, a completely crazy, exciting, holiday season with so much packed into about 3 weeks that I have had to write down what I need to do when. As the pagan New Year approaches, I have been making preparations by completing the next quilt (or altar cloth or display cloth depending on who I am talking to) for my display, and also buying a pumpkin and deciding what to carve into it. The quilt design is still based on 2” squares, but this time there are many triangles incorporated – which sometimes combine to make diamonds. I wanted a lot more movement in this quilt than the one for the equinox, reflecting the flames of this fire festival. Change can happen. New seeds can be sown in the Earth to put down roots through the winter. Ancestors can peek through the cracks and offer their advice and support. My colours are perhaps a little clichéd, but they are what felt right from my scraps pile – which may even fit in its cupboard again by the time I finish all 8 quilts… Now I just have the enjoyable task of creating my display on top, which like all of our displays will find ways of connecting to the seasons as well as the Sabbat, in this case Samhain and our ancestors being remembered. The vibrant orange in the quilt is almost identical in colour to the pumpkin I have found for this year. Pumpkins are a vegetable I have been carving for over 40 years now; I can remember primary school days when other children brought in carved turnips and swedes, and thinking what hard work it looked and why didn’t they just use a pumpkin? The bits we cut out of pumpkins tasted good in pies as well, mixed with enough sugar, eggs, cream and spices, whereas I don’t think we even ate turnips in our house. However as a child I just carved a face each year, whereas as an adult I like to carve more meaningful designs. One side to represent what has been important to me in the past year, the other to sow my seeds, hopes and dreams for the next year. I usually start thinking about what I will carve a week or so before the day, when I see what size pumpkin I have. While planning a design always involves a period of reflection for me, as all spiritual art must come from within, this autumn it has been particularly intense. I mentioned when writing about my Mabon quilt that I had hurt my hip and leg. I have no idea what I did, or exactly what is wrong, but walking and sewing are still very tricky for me, and as for any of the plans I had for when M was in school full time, my leg is clearly telling me they were the wrong plans. Luckily I have found cycling is even better than the physio exercises and really enjoyable in this mild autumn weather. Meanwhile I have had a lot of meditation time to think about what direction I should be going in. The strange thing is that at the end of all this, I realised there is nothing I need to be doing right now except what I have been able to do – which is to look after my family and myself. Except now I have a very small difference in my approach. I value each person equally, including myself as an equal. I am ignoring messages from the media of what I should be doing to value or look after or pamper myself, because I don’t need it. I have no lack, and I have nothing to prove. As a result I am happier than I have ever been before as an adult. I know that even though I cannot do much right now, I should just enjoy the resting period. The future might suddenly be a lot busier. So after all this thought, I plan to make this year’s pumpkin a joint family carve, using cookie cutters to make pictures since the first two requests of fairy and frog should be easier cut that way than freehand. I did a frog last year as well; it must have worked since our tadpoles have been hopping around the garden for the last two months. This year it might go on the thank you side. Quilt for the Autumn Equinox / Mabon. Since both equinoxes are all about balance, I have also been testing an urban myth that has been puzzling me since I discovered it last Spring. There is a much repeated story on the internet that it is possible to balance an egg on its end at the equinox. I tried this, and failed. Then I read it was at the moment of equinox. I have no idea if the Earth is acutely aware of the moment of equinox or not, as with the moment of solstices. There is however a moment when the tides turn, which are of course affected by sun and moon so I didn’t just dismiss it out of hand. So since I missed the right time last time, and it was quite a convenient time this time, I thought I would have a go in the spirit of scientific enquiry. This time I also invited company. Continuing my series of quilted display cloths I have been making, here is my finished quilt for the beginning of August and the colours of the grain harvest. The design is still based on squares, as I did for Litha, but this time I did not have so many suitable fabrics available to me so decided to make some of the shapes bigger. This made it quite entertaining to sew together, since I could never follow any regular pattern! I have deliberately used some of the same fabrics as for Litha, and would like to make that a passing theme through the year: that each quilt has a relationship to the ones either side through sharing some colours, as well as having some that are unique to only that quilt. In this case I am unlikely to use the brightest yellows for anything other than Lughnasadh, but I used the gold prints for the Litha quilt, and will use the darkest red / orange fabric for Mabon and also for Samhain if I get stuck with a lack of other suitable fabrics. It is now forming part of my display as we prepare for the coming festival, and has been adorned with candles, flowers, and some corn dollies we made last year. For the first time we have some wheat in the garden, sown by M at school as part of her ‘Spring Garden’ and transplanted here in April. We will be able to ceremonially cut it on the day and place it centre stage. So a week ago I had an idea to make my temporary seasonal display area (half a mantleshelf) a proper cloth cover, by buying a strip of fabric, edging it, and putting it in place in time for the summer solstice on Wednesday. If I found enough suitable fabrics, I could even change the colour for each sabbat. However, not only did I fail to get near any shops, it being too hot, I also should never really have imagined I could stop at something so simple. Having visitors all weekend required an empty sewing table in order to eat off it, and a lot of thinking time. By Monday morning I had a plan – to use up my scrap pile and make a simple quilt-style top. One for each sabbat of course, starting with midsummer. That gave me Monday to make it. And what I decided on was blue skies, sunshine, and a garden absolutely full of flowers. Mine is full of roses, campanulas, hardy geraniums, foxgloves and peonies right now, so they have inspired the colour choices. 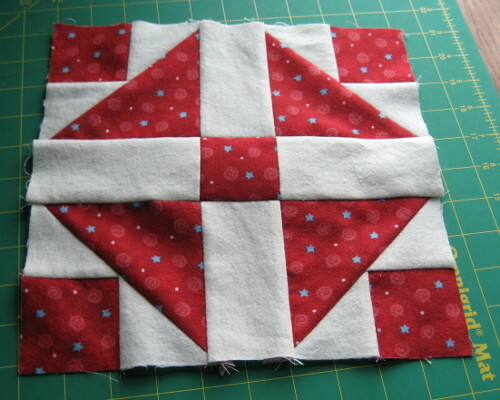 My method of construction was very simple – strip piecing with only a few triangles and rectangles to break up the squares. The colours were arranged fairly randomly, and for once I didn’t worry too much if I sewed the wrong pieces together from my initial plan. Some of it will be covered anyway. There is no wadding, so it was just sewn onto some plain cotton for backing. Quilting is also very simple, just sewing around the edges of a few pieces through both layers – this also sewed up the hole. Total time to be useable was about 4 hours including cutting and laying out time for which I had help, with an extra ¾ hour on Tuesday morning to quilt it. Here’s how it came out. A bit crazy, but fun. You might notice by the length that I have now managed to purloin the whole of the mantleshelf for my display! I try to be tidy, and I like the feel of things being organised, but I don’t always manage it when the creative spirit is fully present. So sometimes I lose things. I stayed calm. Getting cross has never solved anything yet, and I did have enough bits left to sew another one. It is not the first time I have lost prepared quilting pieces, and they have always turned up eventually, but not always in time to be useful. I let go of my attachment to the work I had done and started cutting out replacement squares and triangles, doing the background colour first since I had plenty. The Roman God Janus, who gave his name to January, has two faces so that he is able to look forwards and backwards at the same time. At the beginning of last year I wrote about the things that I hoped to achieve over the year – in the hopes that writing them down would give me the help I needed to make sure they happened. So now honesty compels me to find that list and see if I actually managed any of it… as well as looking forwards to work out where I want to go this year. Sewing – well I did finish the quilt of Pooh’s map, and posted a photo of the completed quilt on my wall in April. I have managed quite a few other sewing projects besides, most of which don’t appear here! Somehow the more I manage to complete, the more projects seem to appear so I now seem to have a list of clothes to make as well as quilting projects for my new sanctuary space and altar that will keep me busy for the whole year and beyond at current rates of progress! Stained Glass – er… I’m glad to say one window I made three years ago finally got fitted (Oak Sunrise, see December post), but no new work was started. Unfortunately I think I’m still a few months off, as this year’s priority is to finish the building work. So my glass tools will have to go back into storage again. But maybe I’ll manage something small towards the end of the year if all goes well. Bodhran playing – I have made a start, and some osteopathy work early last year definitely freed up my shoulders and arms for better playing. I have started to get the feel of the instrument and what it can do, and find that the more bodhran practice I get in the easier it is to play a simple steady beat for journeying. (When M doesn’t want to join in, that is!) But I haven’t found a regular ‘practice slot’ yet and it shows! This is definitely on my list of things to do this year! As well as to drum some healing for the Earth in an outdoor location. Working with elementals – well the garden is now completely replanned to bring in some water features, more flowers, and make it a fun, relaxing space for all. For this coming year I hope to establish a wildlife pond and get the building work finished, so that where there are currently piles of bricks I might be able to reclaim the space as garden. However, having dug six red bricks, a paver and a blue brick out of a small test hole for the pond this weekend, the brick piles are likely to get bigger rather than smaller in the short term! (So far we have dug 4,500 bricks out of our garden, which is about the size of a singles tennis court. They have proved very useful for the extension, but would have been better left in their original arrangement!) So I have felt inspired by elementals, and seem to get some good guidance in meditations about how to develop the garden. But as for working directly with them, I seem to spend my time focussing on weather rather than what is right here. Who knows what direction this will go. Climbing the Wainwrights. Well I spent a week in Cumbria and managed precisely zero hills to tick off his list. The one new hill, two tops, were too low to be included, given that they were below the mist level and also within M’s capabilities. Interestingly however, the guidance I received on a journey was that it would be good exercise for me and help get me fit if I climbed them all, but it was more important for me to get to know the valleys and the streams. Well I did plenty of that! And finally one to add to my list for this year, to make time and space for my writing, so that I can finish the tree stories I have started, and get back to writing longer stories without loosing the flow. With writing also comes reading, because for me the latter inspires the former. However while it was easy to read books when M was little and feeding all the time (provided they could be held in one hand); it is proving much harder to find the time to stop and read for myself as she gets older and more active, and as my ever growing list of things I want or need to do take priority! I am reminded by looking at this list that there are only so many hours in a day, and at best only two of them are mine to do what I like with. But keeping that small part of me alive and focussed on the things I want to do gives me a sense of well-being and achievement – and writing it down like this helps me do that. However another theme has emerged for me from doing this list: I notice how for the first time every single item has a connection to the Earth in some way. I have over the past ten years experienced moments of acute homesickness for places which are most definitely not Earth as I currently know her, and at times I have found this quite hard to deal with. But this past year, I have also noticed how when I make strong connections not just with where I am but the Earth herself, her rivers and hills, her weather, I seem to find a stronger sense of purpose in me being in this life, here right now. That is something which will guide me going forwards, in what I do, and how I celebrate Sabbats. Pins are an essential part of any sewer’s toolkit, but the paper wheel they are sold in, or the plastic boxes, are rarely suitable long term use – hence the development of the pincushion. Some I have seen are wonderful three-dimensional creations in fabric, giving delight to the user. I have seen many lovely examples, such as fruit, circus elephant with a ball, cupcakes, hedgehogs, cacti, etc. Take the pins out and some would be delightful toys for a small child. I will confess to being boringly practical however, since I want to be able to get pins in and out of it quickly and safely, and put it in a drawer when not in use – and I also have a small child! This is a project which has taken me since January to sew, and even longer to plan. It came about after I put an old Pooh Bear poster up on the wall over the stairs. For those who follow Feng Shui ideas, which I have started doing occasionally, it is in the area of the house for Health and Family – so having a poster full of life and enjoyed by all the family seemed appropriate to me. However, there is a radiator underneath, which kept melting the bluetack holding the poster to the wall, so it kept falling off. Usually in the middle of the night or at rather inconvenient moments. Not such great energy! I love Pooh because he is such an easy-going bear. He doesn’t think too hard, just goes with life’s flow and does what comes naturally to him. Hunny or condensed milk? Have both – even if it does have consequences of getting stuck. Lost on a walk? Stop running in circles and listen to the hunny calling. He might be a bit daft at times, when he needs looking after, but most of the time he looks after his friends in a very gentle sort of way, not minding when they are excitable or scared or depressed or trying to be clever or bouncing around. Pooh just is. He is the sort of bear who gets regularly quoted in our family, because he just knows how to live. And who would be without a few Helping Bear or Brave Bear pencils around the place after all? For technically minded people, the quilt uses around 24 fabrics, and was sewn on my very ordinary, basic machine with straight stitches and zig zags. I did the design by scanning the inside cover of my 1977 “The World of Pooh” (which is slightly different to the poster) and then printing out the pictures in sections. After sewing the background of mainly green squares, I traced all the other shapes onto interfacing. 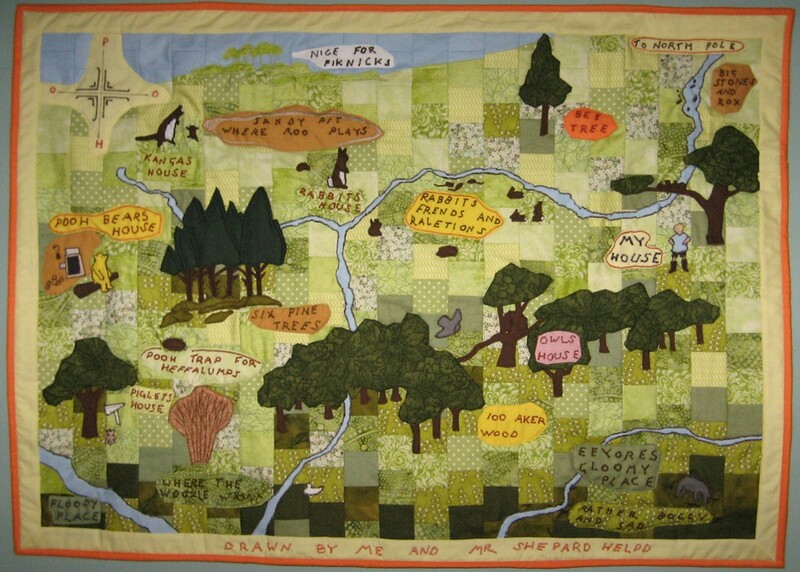 These were subsequently cut out and ironed onto the coloured fabrics, and then sewn on in two layers – complicated shapes such as the animals and river directly onto the green background, then the labels and tree leaves were sewn through all three layers, saving me the job of quilting the quilt later. My most frustrating problem was how small pieces kept getting lost, as turning the quilt to sew had the effect of knocking things off my small and cluttered table… pinning them in place was done as soon as possible! (And I had to re-cut about three that only turned up in my tidying spree mentioned a couple of weeks ago.) My lettering got better with practice, especially after I realised I needed to turn the fabric when the needle was on the outside of a curve, not the inside. I was glad the original lettering style was wobbly! However adding in stitch width to the edges of my shapes was something I wish I had done from the beginning! I would say Happy New Year, as so many people have said to me in the last few days, but I celebrated the year turning at Samhain, and again at the winter solstice. So instead I will say welcome to 2015, in the belief that this year promises even more good things than the last one. I prefer to look forward rather than back, and I spend more time making future plans than reminiscing or worrying about what has gone. If it is true that we get what we focus on, then this seems a good way to be to me! However this is not because I am trying to cut out or ignore the negatives in my life, but part of how I overcame illness. My road back to health that started five years ago included setting myself a target for each day, however small, that I could achieve and feel like I had done something. Some targets were physical, such as going for a walk every day and slowly increasing from half a mile to managing three miles in under an hour. Some were creative, where at the end of it I had something in front of me I could see I had managed to do. It made me feel more worthwhile – and still does, for if I have nothing I am trying to achieve I feel lost. After various thoughts about new projects to tackle, I made some promises to myself at the solstice. I share them here in the continued expectation that what is written down is more likely to happen than what is kept to myself! Sewing – I have started making a quilt of the map where Winnie the Pooh lives, to hang on the wall where the poster of the same picture keeps falling off. (The radiator underneath melts the white-tack sticking it to the wall.) M is being her most helpful ever and loves seeing all the green background pieces being cut out and laid out in position, which is just as well since lack of space means I have to put them on the floor! Bodhran playing – when I wanted a drum for journeying, I bought a bodhran because I loved the sound and it felt right at the time. Now (nearly three years on) I want to learn to play it properly, so that I can use it for both and be more relaxed when I play it. Working with elementals in the garden – I have no idea how to proceed with this one yet; drumming might be involved at least in the first instance. It feels important to me to try, however long it takes. Climbing the ‘Wainwrights’ – the Munros always intrigued me in Scotland, and I have climbed about ten, but mostly they are too big, too demanding, and too far away. Also the list changes from time to time. I was in the Lake District for Yule, an area which I love and have walked and canoed there over many years, both solo and with family. This was the first time I had come across the concept of completing all the ‘Wainwrights’, which are all the fells AR Wainwright detailed in his books in the 1950s. They have the advantages of being a fixed list of 214 fells, some are small, and given it was his personal choice to include them, they all have some feature of interest. I would love to start from scratch and see if I can do them all in, say, thirty years. However I plan to start with the hundred and sixty-odd I haven’t yet climbed and see how I go. If nothing else, it is the best excuse I’ve come up with so far to ensure I get to Cumbria at some point each year! Swimming in Dunnerdale – because it looks amazing. 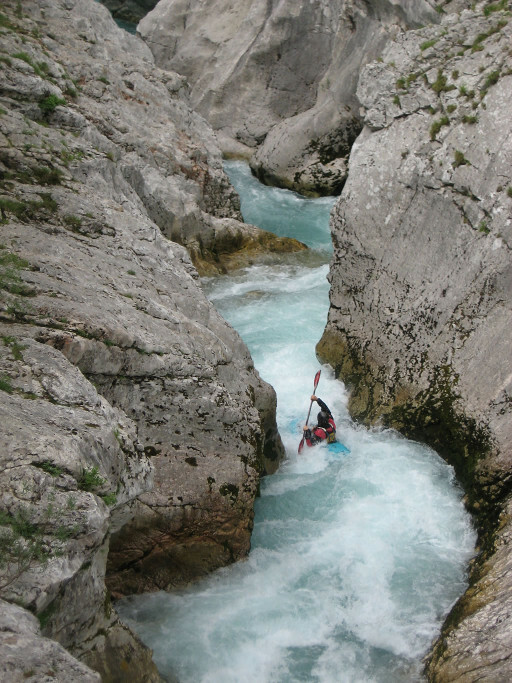 Paddling the Soca gorge took me eight years from seeing a photo to being there – and was every bit as wonderful as I hoped it would be (see the photo!) Swimming under Birks Bridge might take me as long before M is ready and the weather is right, but I’m hoping that is an outside time limit! Given that dreams posted here have a habit of coming true, feel free to add yours in a comment below! I finally finished the third quilt of my tree-inspired series and got it hung on the wall this week. It was the autumn leaves last year that inspired the idea, and since the leaves have been changing rapidly I thought I had better get on with it! The pattern block is called ‘Maple Leaf’, although I mostly did not quilt this in blocks. I started that way at the top, but then had to explore other ways of working… I have made more mistakes and unpicked more seams in this quilt than I have ever done in my life. Even at the layering and safety-pinning stage (no I don’t have time, space or patience to hand baste!) I saw a row of three units I had managed to sew upside down and had to redo them. Hopefully I can use what I have learned from this quilt for future projects. To quilt it I used a spiral design I made up after many scribbles on paper, which seemed to flow really well. The angular patchwork seemed to call for some softening curves, and it echoes the idea of leaves blowing around in the wind – as well as energies spiralling down into the Earth at this time of year. My free-motion quilting still leaves a lot of room for improvement, but at least each one is better than the one before. It is a very fiery quilt as it hangs on the wall. I am glad to have it there to liven things up and add warmth as we head towards Winter, but am also glad I made the decision to rotate the quilts with the seasons. It would need a much bigger space, and a different wall colour, if it was to hang there permanently. My ‘Summer’ tree quilt (left) finally got finished last weekend and has been hanging in our hallway for a week now. It is intended to represent the dappled shade under deciduous woodland, both in colour and design. From my experience doing ‘Winter’ (March 21st) I decided to use fabrics that were either fairly plain, or else had bold patterns since some of the subtleties got lost once cut small and quilted over. I also wanted to keep more contrast between fabrics in the way I pieced them together, but without loosing a sense of being lighter at the top of the quilt so that there was some kind of flow. I was pleased with the end results in this respect. As I mentioned on an earlier post (Going Barefoot, May 2nd), I had a few problems along the way! 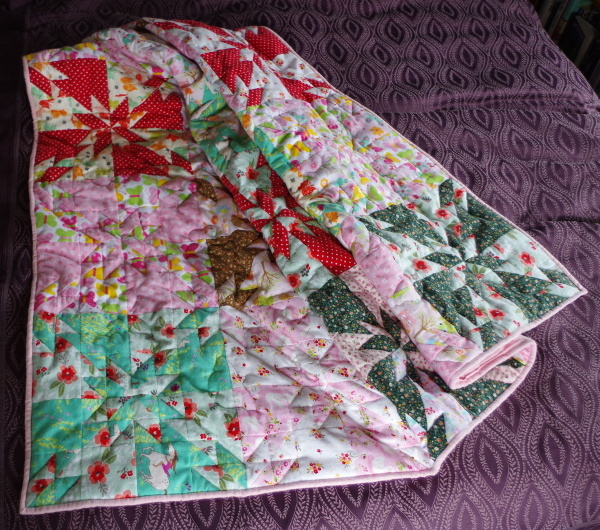 Annoyingly one fabric looked more like a brown once put with the other greens; I might have changed this if I had realised in time, but I decided it was fairly tree-coloured and by quilting enough green thread over the top of it, I hoped that unlike in ‘Winter’ where I lost detail, this time it would work in my favour to help harmonise the colours and give an overall green tint. I think it has done that. However, a much bigger problem was that the quilt grew slightly, my sewing lacking the accuracy needed when it comes to seam allowances, so the border sections were all too short – even with the extra I had allowed when cutting. (Lesson there!) To solve this I added extra triangles in the border; the original design had five, I made this up to eleven. One nice surprise I have had now the quilt is hanging is the effect of approaching it on the diagonal as you come down the stairs. It is almost like having two quilts, the one you see when in the hallway, and the one at 45 degrees. Not something I had anticipated, or ever seen in any other work of art displayed on a stairwell, but something I shall enjoy using deliberately in future for example if I ever find myself doing a stained glass window for a similar position. One last thought – I have discovered M is much happier once my sewing machine reaches a certain pitch, around humming level… It keeps me on my toes at that speed! Last autumn I was inspired by the colours of the leaves beneath some maple and cherry trees to design a seasonal wallhanging, bringing their vibrant energies into my home. The project quickly grew, as creative ideas can, before settling back to something manageable… I hope! I spent some time exploring traditional quilt patterns and coming up with a plan for three quilts that will be displayed in rotation, but that could potentially hang side by side. (Unlikely in this house!) Autumn would be the leaf colours I had seen, done in an irregular Maple Leaf pattern. Winter would be the colours of bark and dead leaves, silver birch and catkins using a very square design, while Summer would be the dappled greens of grass under oak or other deciduous trees. By the time I had completed my designs the seasons had moved on, and to be honest Autumn looked so challenging that I wasn’t sure how to put it together. So I started last December with Winter (shown above), an irregular Pandora’s Box design that I hoped I could manage with a crawling or cruising M tugging at whatever part of me or my sewing machine she could reach. As it happened the only time she had to be banished from the room was when I lay all the pieces on the floor, there being no other space large enough for them, but apart from that I discovered various new ways of working and concentrating to be able to stay in the now, focussing on the fabric but also stopping whenever she needed me. She was present for all except about half an hour… and mostly seemed to enjoy watching it come together. Machine sewing is great that way! I particularly enjoyed my first ever free motion quilting, doing a very organic design and just being guided by intuition as to where to go as the design grew. I haven’t yet seen another quilt with the same shapes as this one, roots and spirals combined. Little hands pressing foot pedals or pulling at fabric added the odd bit of character! However, while I am happy with the overall effect and like the way the pattern helps bring harmony, I was sorry to loose a bit of the detail in the fabric by quilting over the top. As a result I may quilt the others differently. It has also achieved my second aim, to shift the energies in a positive direction in our hallway, the centre of our home, most of which for various complicated reasons (including the plaster falling off one wall) remains the cold turquoise blue that was there when we moved in. I love seeing the quilt when the sun falls on it at lunchtime and brings out the gold colours, showing how much beauty there is in browns. This week I have bought the supplies for Summer. Given that Winter took a month to cut and piece, and another month to quilt, bind and hang, I might just get it done in time for the change of seasons. (Or I might not if the leaves all continue to come early…) Part 2 will follow in a few months time.